Home » Library » Rigging and Project Archive » Sacré Cinquo! – is the 505 really French? Editor’s Note: This article was taken from the 1001 Boats Blog as a measure of preserving it for the enjoyment of the 505 Class. Amazingly the 505 dinghy, still one of the most exciting performance boats in the world, is close to celebrating its 60th birthday. Is it French or British in its origins? It’s a long story – but one that’s worth telling in the full version. Certainly the 505 was designed by British naval architect, John Westell, and equally certainly most of the early hulls were built by Fairey Marine at Hamble Point, but the 505 was not, in fact, the boat that John Westell originally set out to design, and it would never have seen the light of day had it not been for a group of enthusiastic French dinghy sailors. 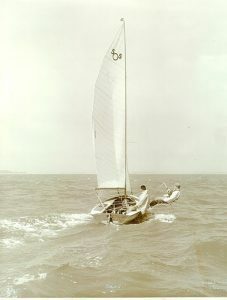 In 1952 the IYRU announced a competition to select a two man dinghy class to be given International, and Olympic, status. The sailing trials held on a lake at Loodsdrecht in Holland were won by the Flying Dutchman, but the national sailing associations of Britain and France were not happy with the choice, arguing that the FD was too heavy and powerful a boat for crews of average size and weight, especially in the open waters around the French and UK coasts. The objections were heard, and new trials were organised at La Baule, in France, in 1953. Among the new prototypes competing was an attractive 18 footer with a cold moulded hull. This was John Westell’s Coronet design, and it was the talk of the event, not just because of its revolutionary lines and good looks, but also because of its sparkling performance. The Coronet was an 18 foot boat with almost 200 sq. ft of sail area. It caught the eye of many of the world’s top dinghy sailors at La Baule, partly because of its beautiful cold moulded hull, relatively narrow waterline beam, and built-in buoyancy side tanks, but mostly because of its wide flaring topsides, which gave it a futuristic speedboat-like look, quite unlike any of the other boats present. It was said afterwards that the trials were weighted in favour of the 20 ft Flying Dutchman. Only the FD had two boats present, while all the other classes were represented by a single example. This meant that the FDs could split at the start, to sail different sides of the course, while the rest of the fleet had to guess which side would pay best. It was quickly apparent that the Dutchman had only one rival. The FDs are said to have had a slight boatspeed advantage on the beat, but the Coronet, with its lighter weight, smaller genoa, and lower wetted surface was quicker to tack and accelerate, so windward honours were divided. The Coronet planed more easily and was faster downwind, however. The two Dutchman crews had the advantage of being able to team race against the rest of the fleet, and, in particular, their only real rival, the Coronet. Whether this was fair or not, the 2 FDs finished the trials with a combined total of more wins and places than any other class, but the Coronet was, by a comfortable margin, the leading individual boat, and, in fact, dominated the series convincingly. The Flying Dutchman once again got the nod from the IYRU committee. Westell was informed the Coronet could apply for International status once 100 examples had been built, but no further Coronets were ever built and the sole example was sold to an East African sailor. This could have been the end of the story, but for the enthusiasm of some of France’s top dinghy sailors who recognised a good thing when they saw it. Soon after the trials, a group of French helmsmen from the French Caneton (Duckling) class which had been represented but seriously outclassed on the water, got together to discuss the outcome and found themselves unamimously in admiration of the looks and performance of the Coronet. The Caneton was a hotly contested development class in France, with some of the country’s best helmsmen, and relatively free rules on construction techniques and hull form. There was a general consensus that a shorter version of the Coronet could make an excellent, more restricted, one-design version of the Caneton class, so the President of the Caneton Association, Alain Cettier, approached John Westell to ask if the Coronet design could be made to fit the Caneton rule. Westell quickly produced plans for a modified Coronet, to fit the 5 metre +1% maximum overall Caneton gauge. The plans were accepted by a Caneton technical committee meeting at the end of 1953, and the Caneton 505 became an official French National class before a single boat had been built! Within weeks the first 505 was under construction in a workshop at the back of a photographer’s studio in Paris. The builders, Messieurs Bigoin and Labourdette, both Caneton sailors, managed to scrounge the wood and tools, but the hull turned out to be slightly too wide to go through the workshop door, so the doorframe and some masonry had to be removed before the 505 could emerge! 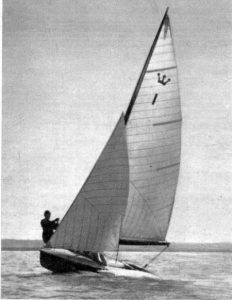 Caneton 505 Number 1 was launched on the Seine at Meulan at Easter in 1954, and tested by several of France’s top sailors. At the end of the holiday weekend Cettier found himself with orders for 10 boats! The original Coronet had been built by John Chamier’s Tormentor yard at Warsash on the Hamble river, but Cettier found that Fairey Marine, across the river at Hamble Point, could produce the hulls cheaper and more quickly, using their hot moulding process in which the hulls were “baked” in a large autoclave oven to cure their advanced aeronautical glues. These first bare hulls were nested together and delivered to France where they were finished by the Sampson yard at Sartrouville and by Mallard at Les Mureaux, both on the River Seine. Meanwhile, Fairey were turning out their own finished version of the “Five-O” for sale in Britain, as well as other bare hulls to be finished by customers or by other yards, in particular Tormentor just a few yards away across the Hamble River. By August there were enough 505s sailing to hold a Franco-British challenge regatta at Ouistreham in Normandy. The early French boats did not feature the characteristic rolled side tanks that we associate with the 505, but certainly some of the very earliest boats finished by Fairey had them, and in time they became a trademark feature of the class. These, and the characteristic flared topsides make the Five-O a relatively comfortable boat to sail, as there is no sharp edge to dig into the crews’ legs, and spray, or at least some of it, is deflected away from the boat and the crew. 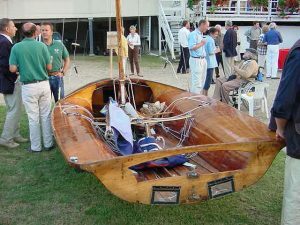 The first boats had wooden masts, but the class rules allowed for all kinds of development in the areas of construction materials, interior layout, running rigging, shaping of foils, etc., and the top boats in the class on both sides of the channel were soon sporting Proctor alloy spars, open transoms, centre sheeting, and other innovations. 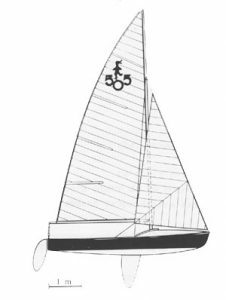 The astonishing performance of the 505 soon brought it to the attention of sailors all over Europe and the World, so the class spread quickly as new racers took up the class, and new builders took on construction. By 1955 with over 100 boats sailing, the 505 bcame an International class in its own right. The first fibreglass hulls started to appear in the latter part of the 1950s, initially composite boats with wooden decks, transoms and side tanks, later, builders like Lanaverre in France and Parker in Britain would produce hundreds of all-plastic boats. Since the class rules allow all kinds of materials, provided essential hull dimension and minimum weight limits are adhered to, the 505 has always been in the forefront of construction technology. Nowadays hulls and spars are of carbon fibre, and stiff hydrodynamically profiled foils promote planing even to windward, but even with all their scarily modern equipment, the modern 505 is still recognisably the same boat as the one that Parisian photographer’s door had to be knocked down for in 1954. Both the Coronet and 505 were designed from the start for a two man crew with a trapeze. John Westell sailed the Coronet in the IYRU La Baule trials and one of the 505s in the first 505 class regatta at Ouistreham. The topsides flare from 1.24m beam at the waterline to 1.88 at the gunwhale, increasing vastly the power of the trapeze while keeping wetted surface area low at non-planing speeds. Fairey Marine built more than 200 hot-moulded wooden 505 hulls. The 505, with all its spars, rigging and racing equipment, can be towed by a Citroen 2CV!